Like many horsewomen, our friend is always on the go. Between a demanding full time job, three kids, and a very spoiled mare named Junebug, there’s never any time to do things like slow down and take off your jewelry before getting involved in the work that makes the awesome life happen. The result? Busted jewelry. Bands get bent, stones are lost, and other distressing, expensive events are all too common when jewelry and life with horses combine. But you don’t have to accept a life without style as the price for life with horses! The solution is simple. Our Rider Rings collection are specially designed for the horsewoman, featuring top quality gold and silver, exquisitely beauty, and sensibly low profiles that can survive and thrive life with a woman who actually uses her hands. 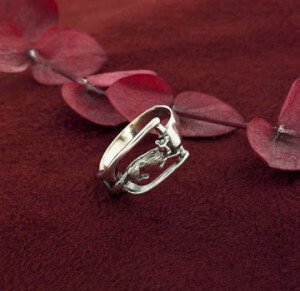 When you choose a Rider Ring, you’ve got a piece of fine horse jewelry that can stand up to the barn or the ballroom. 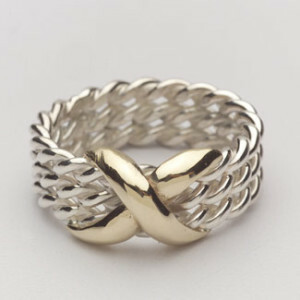 For example, check out this Sterling Silver & 14K Gold Twisted X Ring. Combining gold and silver is a perennial fashion favorite. This classic design combines twisted silver cables with a bold gold X. It’s lovely and incredibly comfortable to wear – in fact, you might forget you even have this ring on until someone compliments you on how beautiful it is! Extremely budget friendly for a ring you can wear every day! Another great ring from our Rider Ring collection is this adorable Sterling Silver Fox in Stirrup Ring. As we all know, great fox hunting jewelry is hard to find. This low-profile ring features a surprisingly detailed fox contained within a stylized stirrup: classic equestrian styling at a very budget friendly price.